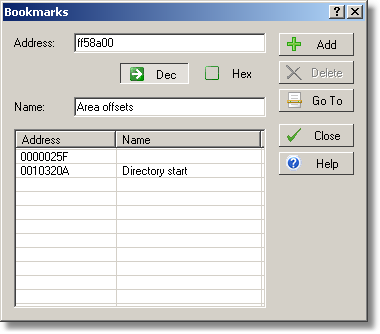 The Bookmark List allows you to create, delete, or edit bookmarks. The Address field must contain a number in the range from 0 to 9,223,372,036,854,775,807 (7FFFFFFFFFFFFFFF hexadecimal). Space characters and commas are allowed and may be used to improve readability of long numbers. Name is optional and may be empty. However if it is specified, it must be unique for the current stream.